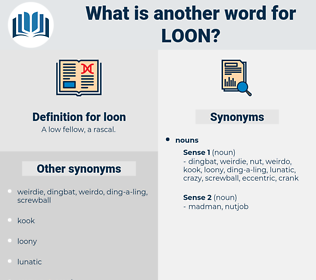 What is another word for loon? A low fellow, a rascal. polymath, intellect, egghead, brain, whiz, genius, sage, thinker, wizard, intellectual, sharpie. What the loneliness of it would be he began to feel, as for hours and hours he saw no human being on the plains; in the thrilling stillness of the night; in fierce storms in the woods, when his half - breed guides bent their heads to meet the wind and rain, and did not speak for hours; in the long, adventurous journey on the river by day, in the cry of the plaintive loon at night; in the scant food for every meal. My wife says that while he was attending me I was as crazy as a loon, but that I was more lucid than the physician. 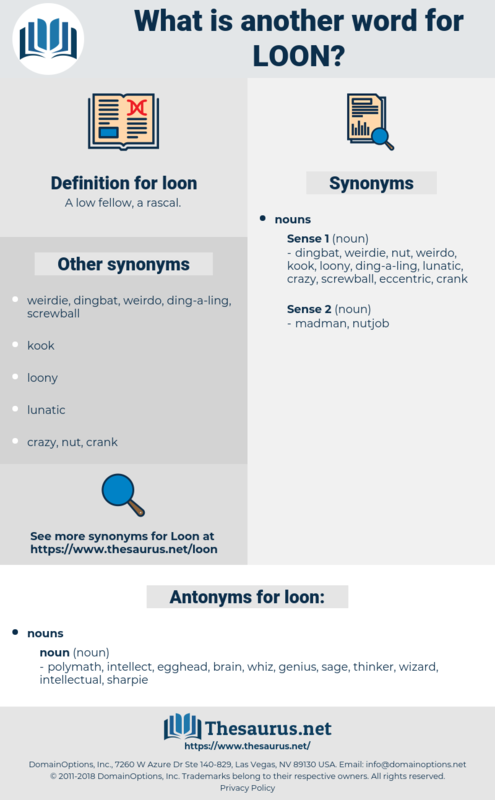 lean on, lemon, lamna, liana, leonine, limey, lamium, lemmon, loony, llm, lemony, lay in, lowan, lem, looney, laney, lome, llano, lean, lyon, lye hominy, layman, lien, line, lime, linen, lamia, limen, limo, lawman, lion, lino, linnaean, lennon, linnean, limn, lyonia, lilium, lan, linemen, loam, loan, lolium, linum, leon, lama, luwian, lohan, luna, lin, llama, lie-in, lemma, leiomyoma, loamy, lineman, lanai, lone, linin, lawn, lemna, lamina, loin, lie in, limonene, loom, linnaea, lame, lumen, lenin, lumma, leone, lm, limonium, lam, lane, lima, lena, liman. do-nothing, layabout, idler, loafer, bum.